Kimmo Rapatti aka Mono Junk seems to be unstoppable these days: After making a personal comeback on foreign labels, the Finnish underground maestro rebooted his own DUM Records. Relaunched with new material by Coopers, the label aims at combining the past and the present, which means that reissues and new tracks/versions are going hand in hand. 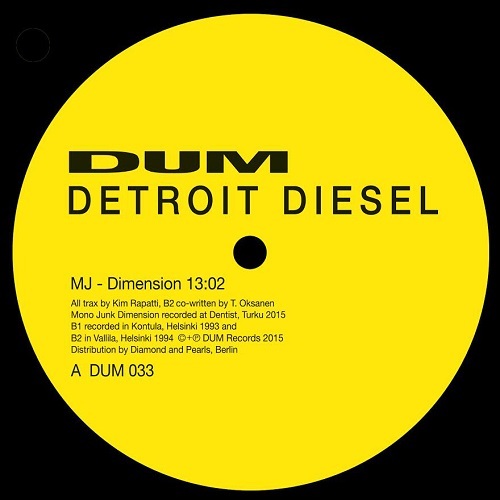 Under the sign of Detroit Diesel, Rapatti has previously released a couple of timeless EPs and on “Dimension’s” B-side he’s exactly bringing back the 1990s with stunning acid tracks produced over 20 years ago. Of them, “Fu-Dimension” is a filthy tool with distorted drums to match Edge Of Motion and “Freestyle” a slo-mo burner from electro’s inception. The A-side features “MJ – Dimension”, a gigantic 13-minute makeover of the title track stuffed with drilling acid sequences that are running on never-draining batteries. For the next two DUM releases are in the pipeline: Firstly Mono Junk will team up with fellow countryman Mesak and secondly Rapatti will collect a couple of vintage A-sides for a four-tracker, also from the much sought-after “Mood EP”, originally out in 1996.